Providing you the best range of glass saw wheel with effective & timely delivery. Glass Saw Wheel offered come developed using quality silicon carbide grits as per national and international quality standards. Made available in abrasion resistance and easy to use finish, these saw wheels for glass material provide for better usage and operation efficiency. With these wheels available in different thickness options, these are suitable for rough grinding, medium grinding and finishing operations and provide for excellent working and functionality support. 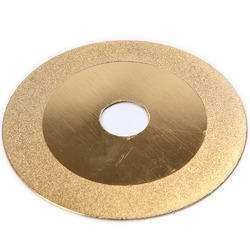 These are also suitable for dry and wet sawing operations and feature use of quality abrasive that makes them more resistant to bending.